You'll be £10.00 closer to your next £10.00 credit when you purchase Destructive and Formidable. What's this? In the seventeenth and eighteenth centuries, the British Army's victories over the French at battles such as Blenheim in 1704, Minden and Quebec in 1759, and over the Jacobites at Culloden in 1746, were largely credited to its infantry's particularly effective and deadly firepower. For the first time, David Blackmore has gone back to original drill manuals and other contemporary sources to discover the reasons behind this. This book employs an approach that starts by considering the procedures and practices of soldiers in a given period and analyses those in order understand how things were done and, in turn, why events unfolded as they did. In doing so, he has discovered a specifically British set of tactics, which created this effectiveness and allowed it to be maintained over such a long period, correcting many of the misconceptions about British infantry firepower in the age of the musket and linear warfare in a major new contribution to our understanding of an important period of British military history. Blackmore has brought several important new topics to light and has added stress to older ones. An important review recommended to those who study doctrine and tactics. An easy read, interesting, and full of useful background knowledge. Required reading for anyone who owns a Brown Bess musket! 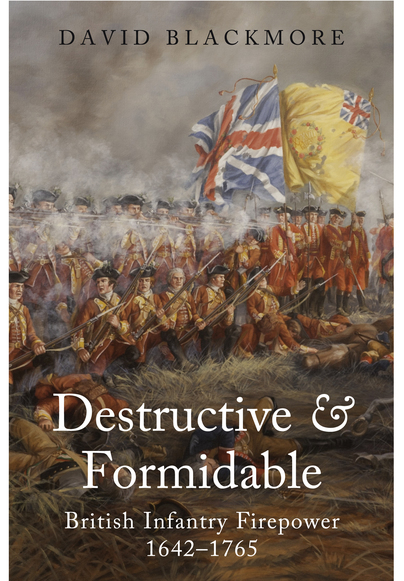 An important study, and essential reading for anyone interested in the British army of the 17th and 18th centuries. The author's findings correct many of the misconceptions about British infantry firepower in the age of the musket and linear warfare. A useful and fine contribution to the understanding of an important period of British military history.